What: Peabody Energy Corporation's (NYSE:BTU) stock fell 32% in July as slumping coal prices continued and competitors careened into bankruptcy. Notably, one of the U.S. coal industry's largest players, and one of Peabody's biggest domestic competitors, appeared set to throw in the towel, suggesting that no company is immune to the impacts of coal's price fall. And that includes an international giant like Peabody. 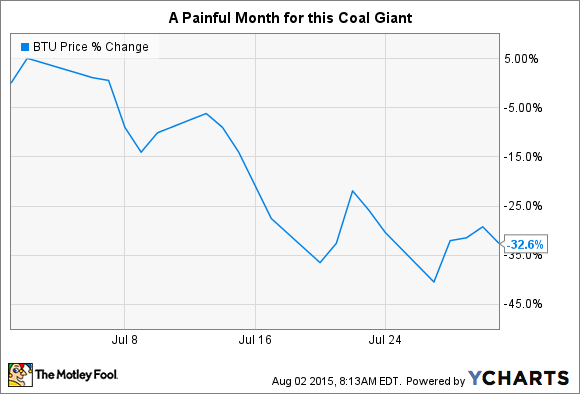 So What: The coal industry has been hammered hard in recent years by low coal prices. That's been driven by reduced demand out of a slowing China for both thermal and metallurgical, or steel making, coal. However, in the domestic market, low natural gas prices and an environmental push that's targeting coal power plants has only added to the list of negatives in the United States. None of these trends appears likely to abate in the near term. Which means continued pressure on Peabody and its peers. That should leave Peabody mired in red ink and make covering its expenses, which are large at any miner, an ongoing issue. Now What: Essentially, Peabody isn't out of the woods yet. True, it has a globally diversified portfolio, which its domestic peers lack. But that doesn't change the weak operating environment, weak financial results, and the real risk that Peabody could fall beneath a heavy debt load just like so many of its peers. Unless you are a high-risk contrarian investor, Peabody probably shouldn't be on your buy list.